current recruitment notification has released on 20th December-2018. Candidate must be below the age of 35 years and above the age of 18 years are eligible to apply for the above vacancies. 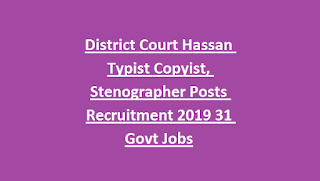 Application forms for these vacancy available from 20-12-2018 @ https://districts.ecourts.gov.in/hassan-onlinerecruitment. Last date to submit applications through online is 19-01-2019 along with self- attested documents, Photograph and signature etc. Qualification related information for each post available in the notification. Selection of candidates is based on Typing Test/ Written test and Interview. 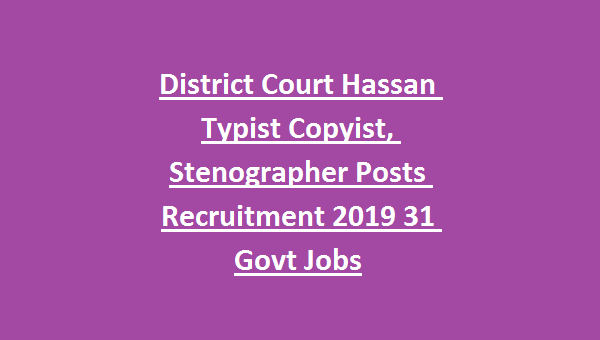 For more information regarding Pay Scale, Academic Qualifications, Application Procedure, Available vacancies, Selection process of Hassan District Court Recruitment of 31 Stenographer, Peon, Typist, Typist Copyist & Process Server Govt Vacancies are stated below. Total no of vacancies available in Hassan District Court Recruitment Exam are 31 posts. 3. Typist Copyist: 07 posts. 4. Process Server: 00 posts. Qualifications required for Peon Jobs is 7th class pass and for all other posts is SSLC or equivalent examination pass. See the notification for detailed qualification info. Pay scale for Peon Jobs is Rs. 9600-200-12000-250-13000-300-14200-350-14550/- . Age limit for general category candidates is 18 years to 35 years. For Cat- 2A, 2B, 3A, 3B is 18 years to 38 years. For SC, ST, Cat I is 18 years to 40 years. Application Fee for general candidates is Rs. 200/- and for SC/ ST candidates is Rs. 100/-. Candidate selection for Peon, Typist and other Jobs will be based on their merit/ typing skills in Typing test/ written test and Interview depending on the post. See the Hassan Dist notification for selection process.